David Housholder takes some real risks with The Blackberry Bush–risks that yield sweet results. 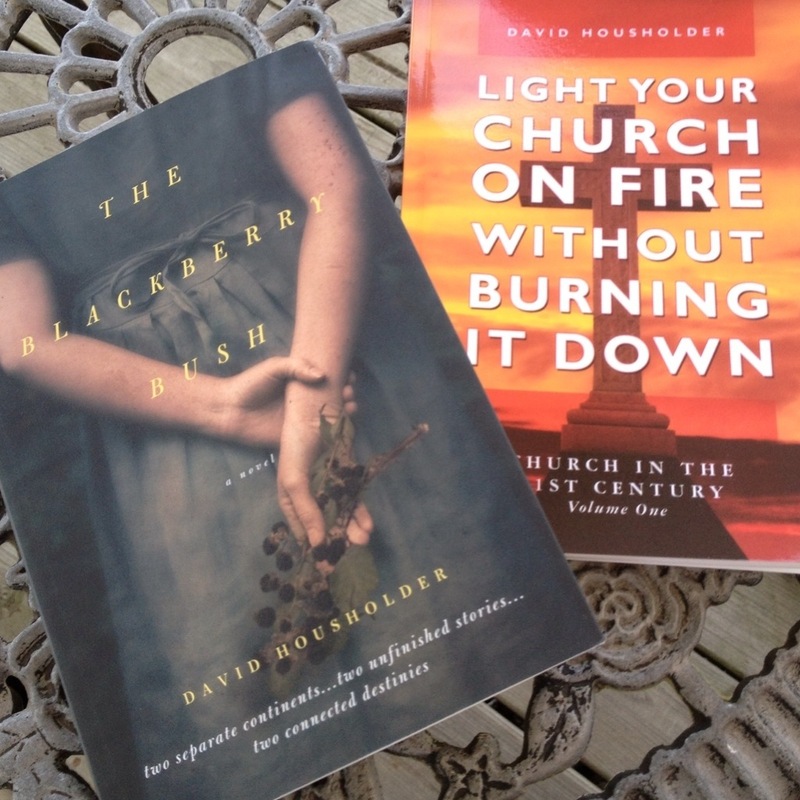 NOTE: I received a signed copy of The Blackberry Bush novel as a gift from the author, David Housholder. We are friends and we work together at Life & Liberty, which is Housholder’s online magazine. His gift of this (and his other book) was with no strings attached. I am under no obligation to give a positive review of the book. The Blackberry Bush is the coming of age story of Kati and Josh, two young people whose destinies are intertwined. The characters were born on the same day and are distantly related. But they live on separate continents and have no concrete knowledge of one another until a brief and life-changing encounter in their early twenties. The book repeatedly mentions blackberry bushes: characters walk among the bushes, get scraped by the thorns, etc. Housholder uses the blackberry bush symbolism to represent that which ensnares us in life. The challenges we face, the demands made of us, and the choices we make often grow out of control and it is hard to emerge from the bracken unscathed. As Housholder leads us through the thicket with Kati and Josh’s stories, he personally risks some scrapes in the choices he has made as a storyteller. These risks prove to be fruitful for the reader. The first major risk that Housholder takes with the novel is that of introducing a cast of characters that span generations and live on separate continents. The stories of numerous characters are woven in with the telling of Kati and Josh’s stories as we learn about their parents, grandparents and great-grandparents and find out how Kati and Josh are related. While telling so many stories in the space of one novel may be risky, I found each of the characters to be very interesting. I loved hearing the backstories of the choices of Kati and Josh’s elders that led to where they each wind up. If anything, I would enjoy learning even more about Kati and Josh’s parents. And I was especially intrigued by Josh’s grandmother, Adri. To hear all of these stories, the reader is taken back and forth–through time and across continents. Housholder pulls this off beautifully. It helps that he provides a family tree that the reader can refer back to as the characters are introduced, and he makes effective use of the omniscient “Angelo” who narrates just enough to seamlessly weave the stories together. A second big risk that Housholder makes is that he does not shy away from difficult realities of life. While the book’s central theme is deeply grounded in biblical truth and the main characters are Christians, Housholder does not try to sell the Christian life as all sunshine and puppies. Characters go to church faithfully while also wrestling with substance problems, thorny relationships, and troubling self-image. This is risky on Housholder’s part because many Christians see struggles in life as a sign of weakness or lack of faith. Furthermore, a frequent criticism of Christians from those outside the faith is that they are just a bunch of hypocrites who say they believe in Jesus but fail to live up to his name. Promotions of the novel promise that readers will find their stories in this book. Despite my friendship with the author, I was skeptical of this promise. I mean, how could my life possibly be reflected in a novel written three years ago by someone I just met last summer? Pluswhich, since the main characters are just kids, I didn’t think that I, as late-thirty-something, would have much to relate to. As much as I admire Housholder’s work and value his writing, I just could not imagine I would see myself in the book. First of all, I found bits and pieces of both Kati and Josh’s stories with which I could personally relate. But I was especially taken aback by elements of other characters’ stories that felt intensely personal to me. The truth is, this book hit me in ways that I will not be writing about publicly–ever. By exposing so many very real and very raw realities of our human experience, the book does keep the promise of readers each finding their own stories in it. The truth is we all have struggles–no matter how strongly we try to keep the faith. And as so much of my own life still seems so very much a work in progress, I feel very much that I personally am still in the thick of the blackberry bushes. But Housholder does not leave Kati, Josh, and the others, or you and me, lost in the bracken. He gives us the hope of a God who seeks to free us from the entanglements of life. The third big risk that Housholder takes is that of choosing to talk about God and faith in very ordinary language rather than distinctively Christian vocabulary. His language about God and faith is approachable even for those with minimal experience with the Christian faith. While church attendance is mentioned, and the name of Jesus is invoked in prayer, this book is not a sermon or a doctrinal statement about the Christian faith. Consistent with my experience in working with Housholder, he seems, in the novel, to be more interested in the character’s spiritual experiences than with their theology. What Housholder or his characters believe about the life, death, and resurrection of Jesus is not given much detail. Readers looking for a Christian novel to use as a glorified Gospel tract will be disappointed with The Blackberry Bush. On the other hand, readers looking for conversation about what it means to live fully for God will find this to be a brilliant discussion-starter. Through the risks that Housholder takes with generations and geographies, acknowledging the entanglements of life, and fresh vocabulary for God and faith, he yields a thought-provoking and heart-warming novel. And while it stands on its own as a meaningful work of fiction, it can bear even more fruit for readers who do allow the stories in it to interact with their stories. This would work well as a springboard for personal journaling or for book discussion groups. Questions in the back of the book can help readers work through the major themes presented in the novel. I recommend reading and sharing The Blackberry Bush. To read my reaction to Housholder’s other book, Light Your Church On Fire Without Burning It Down, click the title. In my last post I mentioned my friend Sarah Bessey and her new book, called Jesus Feminist. I recently had the opportunity to interview Sarah about the book for Life & Liberty! As an old friend I am super excited for Sarah getting a book published. And as a woman of God, I resonate with the particulars of this book. I read an e-version of the book from Net Galley and was moved deeply by the beautiful vision that Sarah casts for the mutuality that is possible among God’s people. Sarah coined the term “Jesus Feminist” and it boils down to the idea that being a follower of Jesus has led to an understanding that women are people too. My own study of scripture affirms this conviction as Jesus and the gospels routinely lift up women. I credit Sarah with helping me see feminism in a positive light. You can read more about why I identify as a “Jesus feminist” in my previous post titled, I’m a Jesus Feminist Because I Don’t Have to Be One. Sarah lives in Canada (her homeland) with her husband Brian and their three “tinies.” She’s a non-denominational charismatic and just overflows with the love of Jesus in every aspect of her life. Sarah calls herself “a liberal to the conservative and a conservative to the liberal” and she often takes what she refers to as “the third way” on difficult issues. Her writing–on her blog (sarahbessey.com) and in the book–is both poetic and prophetic. It’s an excellent book and I highly recommend it for anyone who cares about the church and the movement of God in our world. This book would also be ideal for a group study or a retreat. Click the book cover to learn more about the book and to order yours from the Life & Liberty Amazon store. Disclaimer: Links in this post will take you to the Amazon store at Life & Liberty, an online magazine where I am a contributor. Any purchase you make there will help support our work at Life & Liberty. 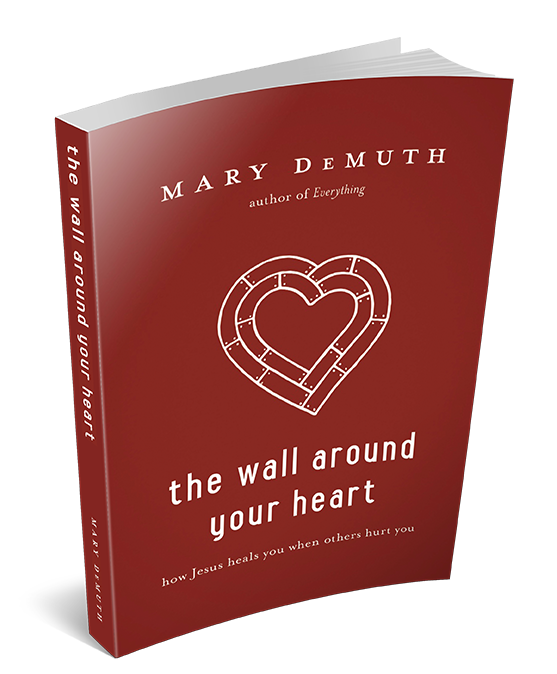 I have had the privilege of serving on the launch team for Mary DeMuth’s new book, The Wall Around Your Heart. As a member of the team I received an advanced copy of the book to read. I am a big fan of Mary’s blog and anticipated that the book would be excellent, of course. But it was even better than I expected. The Wall Around Your Heart is based on the idea that when people hurt us, it is natural to want to put up defenses to protect ourselves. But Mary says that when we wall ourselves off from painful relationships, we also keep ourselves from healthy relationships that can help us heal. Using The Lord’s Prayer as a road map, Mary walks the reader through the journey of healing from relational pain. Mary goes phrase by phrase, and sometimes even word by word, through The Lord’s Prayer gleaning insights about God’s love and the blessing of community along the way. Immediately when I learned of this book, some old hurts came to mind. I had a feeling that God was going to use this book to help me deal with some of those old hurts. I know that I had been harboring bitterness in my heart–even unforgiveness at points. What really blessed me about The Wall Around Your Heart is that Mary acknowledges the yuckiness of relational pain. She acknowledges how very, very hard it can be. Mary doesn’t sugar-coat pain. She has personally experienced more pain in her lifetime than I can even imagine. She goes into more detail about that in the book, but suffice it to say she understands pain. This approach to the question of forgiveness helped me see my old hurts in new ways. It gave me more compassion and grace for those who have hurt me. But the book is about more than just forgiveness. In a chapter titled, “May Your Kingdom Come,” Mary names five different types of kingdoms that we create for ourselves that keep us from allowing God to reign in our lives and hearts. I was really challenged by some of those! The only aspect of the book that was a little tricky for me was a fine point about theology that I didn’t quite understand. In one or two places Mary talked about God being “sovereign” and that is a concept that I haven’t really learned much about in Lutheran theology classes I’ve had. But even at that Mary does not try to propose pat answers to the questions of why bad things happen to us. I strongly recommend The Wall Around Your Heart for anyone looking for God’s hope and healing from relational pain. It is well-written, it deepens how we think of The Lord’s Prayer, and it is full of grace. You can order the book from my Jennifer Tinker’s Fave Titles section of the online book store at Life & Liberty or ask for it at your local bookstore. You can also listen to my in-person interview with Mary DeMuth and you can read about my two meetings with Mary and what it is like spending time with this woman of God that I admire.